I’ve been battling some wrist issues lately that makes writing and drawing a bit painful. I am in the process of overcoming this but I also had to fight some horrible sinus mess that had my head aching, with special focus on my ears. NOT GOOD!!! Seriously folks, I was miserable!!! Anyway, it was just too much for me to deal with to attempt to draw too. So, I decided to share some of my favorite artists with you. 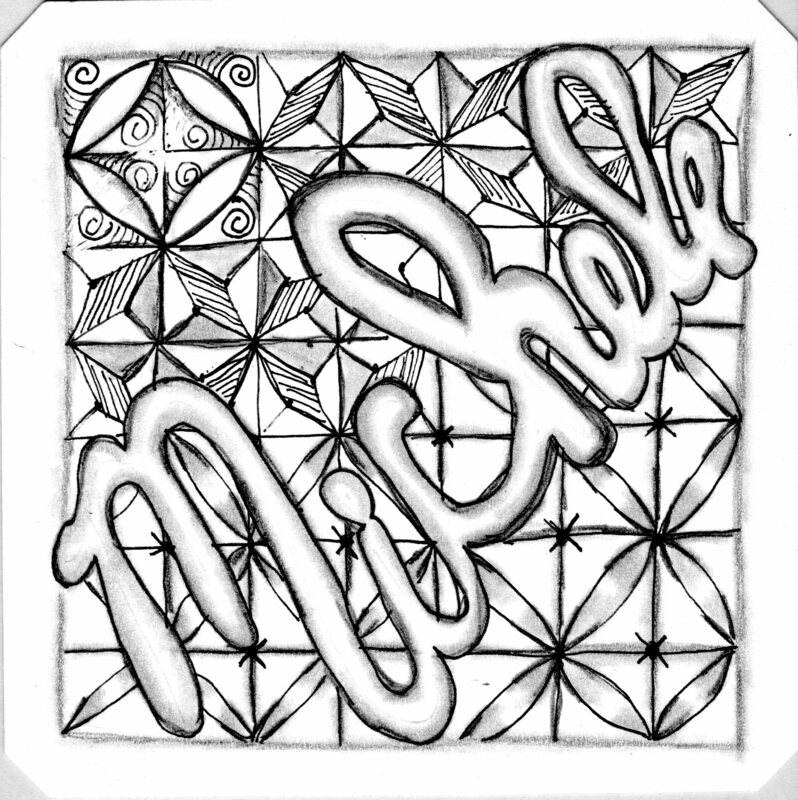 I guess I should start with Rick and Maria, the creators of Zentangle. I learned about this art form from a fellow home educator who was teaching a monthly art class. I’m so thankful to Cheryl for introducing me to this easy art form that has been so meaningful in my life. I’m also thankful to Rick and Maria for using the time honored technique of stepouts that makes it so easy to obtain good results. Sometimes it is better to see the tangle drawn but most of the time the stepouts is enough. One of the first to make an impact on me was Sandy Kelley-Jones. I don’t know her in real life (irl) but she added such contrast with a lot of black inked backgrounds. Just gorgeous. She inspired me. (I loved her work before she even became a CZT. ) Turns out she is friends with the lady that does our Tulsa Zentangle Group, Pam. What a nice coincidence. Sandy created a closed facebook group where members share their daily tangles; it is aptly named Today’s Tangles. Eni Oken is another that has left her mark on me. Although she was an artist before finding Zentangle so she keeps her artist ways in shading which has been a real challenge for me. One of the things I love about Zentangle is not having to worry about where the light source is. It seems like Eni finally realized this when she got into Zendalas. But she has helped me become who I am with regards to this form of art. The next one that really inspired me is known on facebook as Lily Moon. She does some amazing work. 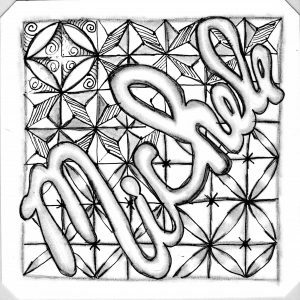 For any that don’t know, she has a website where she shares her tiles and tangles she creates. I really like caracole. I don’t do it justice but I like it and her art. The most recent one impacting and inspiring me, is Zen Linea whom I also follow on facebook and do not know irl. Her work is just stunning and adds a bit of color. I will admit that in the very beginning of my Zentangle experience I wasn’t sure about the lack of color. But as I drew it myself, it was so freeing. I got to where I preferred it to those that had used color. But then this artist started adding just hints of color and I could see how it enhanced the art. Now she has some amazing colored work. She has a website and has started doing videos too. Very nice to see how she does what she does. When I went online to get the links for this post, I came across this interesting post on Today’s Tangles for a summer challenge. I wish I’d have seen it at the beginning of the summer but then again, I was so busy I doubt I’d have committed to doing this. But it sounds interesting to me now and may start this or something like it next month. We’ll see. Who knows, maybe I’ll use it as a jumping off point and start filling up the empty spots (which is most of them) in my Tangle-a-Day calendar. Oh! As I was looking through the summer challenge I saw she had a clarification page. As is typical, I followed the bunny trail and found that Zentangle Project #3 incorporated some color and white chalk. I enjoyed watching the videos of Molly and Maria adding the color to their finished lineart. Well, I hope that I’ve shared something here today that will inspire you.